Oakland-Tod Goldberg discusses and signs "Gangsterland"
Diesel, A Bookstore in Oakland welcomes author Tod Goldberg to the store to discuss and sign his new crime novel, Gangsterland, on Sunday, October 12th at 3pm. Joining him in conversation will be author Joshua Mohr. When, Sal Cupertine, legendary hit man for the Chicago Mafia, makes his first-ever mistake and botches an assassination, he's forced into a radical plan to save his own skin. After a few surgeries and some intensive training, Sal Cupertine is no more. Instead he is Rabbi David Cohen, leading a growing congregation in Las Vegas, overseeing the temple and the new cemetery, feeling, to his surprise, his wicked past slipping away from him, as he spouts quotes from the Torah and the Old Testament. Yet, as it turns out, the Mafia isn't quite done with him. Soon the new cemetery is being used as both a money and body-laundering scheme for the Chicago family, and there's a rogue FBI agent out there who isn't about to let Sal fade so easily into the desert. 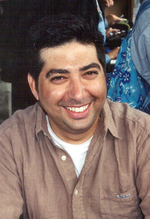 Tod Goldberg is the author of the novels Living Dead Girl, a finalist for the Los Angeles Times Book Prize, Fake Liar Cheat, Burn Notice: The Fix and the short story collection Simplify, a 2006 finalist for the SCBA Award for Fiction and winner of the Other Voices Short Story Collection Prize. Tod Goldberg is the author of Fake Liar Cheat, Living Dead Girl, and five novels based on the popular television series Burn Notice. His non-fiction appears in many publications, including The Los Angeles Times and The Wall Street Journal, and he can be heard on Literary Disco, a podcast he co-hosts. Gangsterland, his third stand-alone novel, centers on hit man Sal Cupertine’s attempt to obtain a new identity as a Rabbi after a botched assassination attempt forces him to kill three FBI agents. But as Sal soon learns, neither the mafia, nor the FBI agent out to get the party responsible for killing his three partners, will be easy to escape. Tod Goldberg is currently considered a "single author." If one or more works are by a distinct, homonymous authors, go ahead and split the author. Tod Goldberg is composed of 1 name.